Don't make your idea wait. Turn your part design into a functional plastic prototype. Plastic injection molding is the ideal method for quickly producing functional plastic prototype parts for testing. Our injection molded prototypes offer the advantage of testing the molding process with your exact production material so that any process or material design flaws are discovered early on. We can bring your product to life without sacrificing your design specifications or your budget. Parts replicate what is needed for real-life testing. Design specifications are not compromised. Parts are made with an ability to add tolerance. Ability to learn from the design and part development process. Material shrink/contraction can be planned for during the design process and inspected during development. Production-quality prototypes start with production-quality molds. Rather than reducing prototyping costs by using aluminum tooling, we keep tooling costs low and quality high by using our proprietary MTS solution. This results in parts that can be used with confidence for design validation. 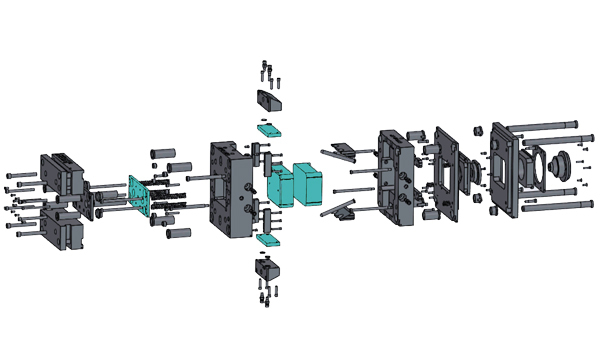 When the ERC was formed, we invested in building a modular tooling system in which we own the mold bases (pictured in gray), so our customers only have to pay for the inserts (pictured in blue). The inserts require less steel and less time to work on which reduces the overall cost and lead time of the tool build. Our prototype tooling is constructed from P20 steel to ensure that parts will be made to your exact specifications and tight tolerances. All of our prototype and bridge molds are designed incorporating the highest level of quality and features that can be transitioned into use for low volume production. Reduces upfront capital needed get your project off the ground. Built to mimic a production tool to produce production-quality parts. Steel molds have longer lifespan and can withstand abrasive/filled materials. Test your parts without wondering if the fault is in your design or the part. Your prototype mold can be used for low volume production. Once the mold inserts are complete, they are fit into the mold base and placed in our automated injection molding press. Parts are monitored by our proven RJG software, allowing the press to run day and night - even on weekends and holidays - without requiring an operator to remove parts or monitor quality. As a result, we're able to offer a quicker lead time and lower part price on prototypes and small production quantities. We also offer insert molding, overmolding, automatic unscrewing molds for internal threads and hand loaded molds for customers on a limited budget. Use our Rapid Quote form to get a quote for your next project!